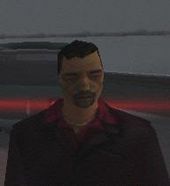 The Kanbu is a character in the 3D Universe who appears as a minor character in Grand Theft Auto III (set in 2001). He is an associate of Yakuza co-leader Kenji Kasen. He speaks briefly in Japanese during his appearance but his voice actor is not credited. The Kanbu was born and raised in Japan before, at some point, moving to Liberty City in America. Kanbu, a high ranking associate of Yakuza co-leader Kenji Kasen, is later arrested for an unknown crime and was scheduled to go on trial before being broken out of an Liberty City Police Department prison cell by Claude on orders from Kenji. After rescuing the Kanbu, Claude drives him to the Hyaku Dojo in Bedford Point. In Japanese, kanbu (幹部) means executive. This page was last modified on 9 November 2013, at 14:02.